We’re just 3 days away from this year’s MadeByGoogle event. While it’s nearly impossible to keep everything under wraps, we’ve seen a comically large number of leaks of this year’s Pixel line-up, most notably of the Google Pixel 3 and Pixel 3 XL. We’ve even seen the third-generation Chromecast, Google Home Hub smart display, and Pixel Stand wireless charging dock. But one product that hasn’t leaked as thoroughly as the others is the upcoming detachable Pixelbook code-named ‘Nocturne‘, which will apparently be marketed as the “Google Pixel Slate” and will serve as the 2018 refresh to the Google Pixelbook. 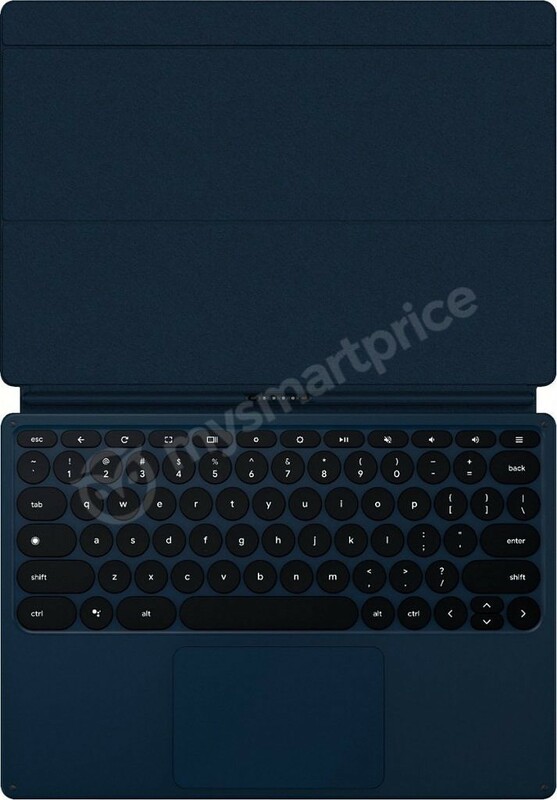 We already know quite a few things about this upcoming device thanks to Chromium source code, but we finally have what appear to be marketing renders of the Google Pixel Slate detachable tablet thanks to MySmartPrice. The Google Pixel Slate seems, design-wise, like a child between the Google Pixel C and the Google Pixelbook. You could call this an updated Google Pixel C: The Pixel Slate supposedly has a big touchscreen with a 3:2 aspect ratio, a rear camera in the top corner, and a slim metal build. However, a few things are different: the Google Pixel Slate will be running an updated, tablet-optimized Chrome OS build, which should provide a better desktop experience compared to the Google Pixel C’s Android Marshmallow/Android Nougat/Android Oreo build. Furthermore, the Pixel Slate tablet still has support for all of your favorite Android apps, so you’re not missing out on anything. It’ll also have dual, front-facing stereo speakers, a USB Type-C port, and possibly a fingerprint scanner on top. Just like the Google Pixel C, the Google Pixel Slate will have a detachable keyboard accessory which will allow you to dock your tablet and use it just like you would use a laptop. We will also be getting a capacitive stylus, although we have no clue on how feature-rich will it be. Both accessories are not confirmed to be bundled with the Google Pixel Slate out of the box, but we’ll probably get to know that after the unveiling. We still have no definitive information on the device’s hardware specifications outside of a few benchmark listings, but we suspect it’ll have specifications at least on par with last year’s offering. That means it should handle Linux apps in Chrome OS with ease. And while we don’t have pricing or availability data, there’s little doubt in our minds that it’ll be a premium offering.